You’ll see this around a lot today, but I just wanted to post something before I head out of here. Have to say goodbye to some peeps, clean up the room a bit (much) and yeah. Then I’m off, maybe around noonish? 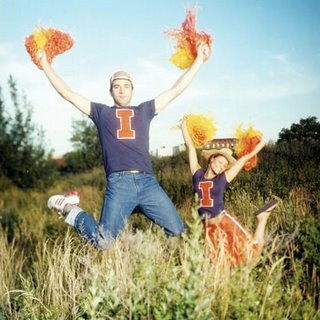 Anyway this is a new Sufjan Stevens song that Pitchfork posted today. It’s the song I was most anxious to hear when Sufjan talked about cuts from the album. It’s weird timing and the instruments are all meant to sound electronic. Really strange yet cool. Might be back to blogging Sundaaay. See you then! Uhh yeah that sounds pretty good to me. How about you? You need evidence? Yeah uhh okay here it is. Their self-titled album comes out May 2 on Alien8 Records. Be their friend, hear more songs. I’ve been tryin to recoverrr fully from my wisdom teeth operation sooo excuse me. Plus I am trying condesne my crap I’ve accumulated over the semester. Will be leaving to start the trek back to Texas tomorrow sometime sooo I ought to get going. I’ve also been tryin’ to spend time with people I won’t see for a very long time soo yeah. Anyway I just found out that Jealous Butcher Records is releasing the vinyl version of Kill Rock Stars’ re-release of Tarkio, aka Decemberist Colin Meloy’s old band in college. They’re a great alt country band that I wish had put out more, but still put out a lot, as evidenced on the two-disc Omnibus. Here’s a track from their radio appearance on Montana’s KBGA, a Squeeze cover. Speaking of Conlin Meloy, head over to Each Note Secure and pick up a solo Colin track off the KRS singer-songwriter compilation The Sound the Hare Heard. It’s different than his Decemberists stuff, so be wary! I haven’t heard the rest of the album Beams by the Presets, but this track is pretty hot. The Australian duo’s debut album has been making a buzz, and hopefully they’ll make some sort of dent in the electro dance scene. The Presets-Are You the One? I didn’t even knooow Canadian upstarts/cuties Pony Up! had an album coming out. Surprise! They do. It’s called Make Love to the Judges With Your Eyes that’s coming out on Dim Mak May 9th. You may have fallen for the Montreal serial cutesters’ debut self-titled EP with quirky love songs like the fan-obsessed “Matthew Modine” or the forceful “Shut Up and Kiss Me.” Live they’re full of funny jokes, so make sure you see them. Oh and pop hooks and handmad glitter t-shirts. A sad title, and not a very upbeat song. I hope this isn’t a new change for the album, or I’ll miss the sugary sweetness I’ve come to love from PU! We shall see. Also! Good news from Dim Mak’s site, DOH favorites The Rakes are planning on a full US tour in July! If they don’t hit Texas, there will be blood and maybe crying. Okay so you’ve probably heard this new Xiu Xiu song if you’re a diehard fan or even just a casual listen. Well this recording of this new song off the new record The Air Force blows every other recording out of the water. The song, “Boy Soprano,” has already become a live favorite, mostly for the fact that it’s Caralee McElroy’s Xiu Xiu song where she’s the singer and Jamie doesn’t help. Instead he’s jamming on their bell set. When they performed it at SXSW, I could hear about 7 people whistling or humming it after it was done. Catchy? Yes. Oh and here’s your first look at the cover art for the new album, The Air Force. Ummm…yeah. 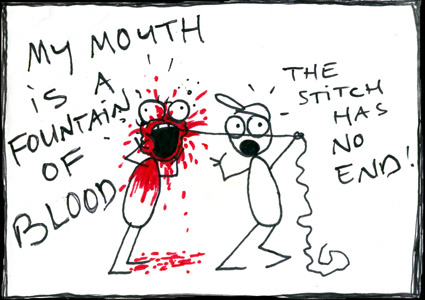 So I’m going to have to rename this blog Boy With Six Wisdom Teeth. Because I do/did. Uggggh probably most miserable experience of my short life so far. Anyway I’m gonna be watching about 3,000 episodes of Strangers With Candy today/tonight sooo have fun with this track you heard three times last year.